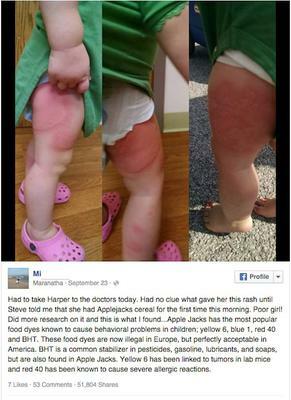 Apple Jacks cause a rash? A mom took her child to the doctors because of a really bad rash that broke out on the child's leg. Unfortunately, there isn't much doctors can do besides prescribe some drug. Seeing a rash like this is quite scary. I remember one year having a rash like that but it spread all over my body from my legs, to my stomach, my chest, and my neck. I believe it was from sitting on hay. Back to the mom and the baby's rash. I believe it was her husband that said she had Applejacks cereal for the firs time that morning. This is what she now believes caused the bad rash. She started finding out that Apple Jacks has ingredients that causes behavioral problems and many of the ingredients (dyes) are now illegal in Europe. I have been talking about diet for a long time. This is nothing new to many of my readers who follow me. I have many naysayers who say diet doesn't do anything. Some doctors even say diet wont change a whole lot when it comes to ADHD. Hopefully everyone wakes up and changes their diet. We are going to see a lot of reactions getting worse over time but we can turn it around by cleaning up our diet. i think the cereal did cause it. My son is experiencing the same thing on his chest right now for the past two day i was wonder what bit him??? but i saaw the article on facebook and realize is the same rash and he had apple jacks for both days.